Beginning with their first album, 2005’s Chéjere…Con Son, Chéjere has established itself as one of Mexico’s leading interpreters of traditional “son” music. 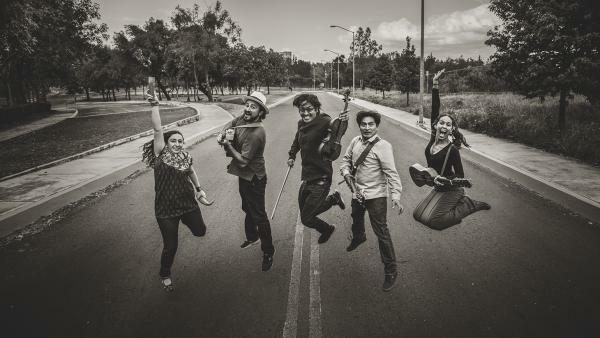 Anchored on the syncopated rhythms of ‘Son Jarocho’ from Veracruz and other Latin American genres, the quintet creates a uniquely contemporary sound. Their first two albums, Chéjere…Con Son and 30 Años were sensitive renditions of traditional folk music. But with 2012’s Ojos De Luna, Chéjere staked out new territory with an album of all originals, incorporating non-traditional instruments including violin, guitar, güiro, contrabass, electric bass and tres cubano. Driven by complex Mexican rhythms, Ojos De Luna incorporates music from all over the Latin world, including festive Caribbean and Afro-Peruvian traditions, developing a Pan-American sound that has become Chéjere’s hallmark. The music of Chéjere is warm and sensual, full of an overflowing and contagious energy. Their songs reflect the passion its members offer to anyone who wants to be captivated by its melodies, lyrics, rhythms and improvisational vitality. Chéjere has performed at prestigious festivals and venues across the globe, including Festival Internacional Zacatecas; Cumbre Tajin; Expo 2010 Shanghai; World Song Festival, Beijing; Instituto Cervantes, Japan; Festival del Caribe, Cuba and the Kennedy Center in Washington, DC.